Why learn about something as simple and ordinary as breathing? 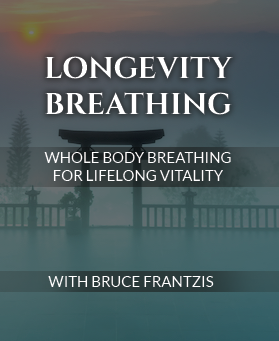 Bruce teaches a breathing practice virtually unknown in the West that keeps you relaxed and better equipped to cope with fear and anxiety. Experience smooth, deep breathing daily and improve your health. Eastern medicine has brought two major breathing systems to the West: one is Pranayama or yoga breathing; the other is Taoist breathing, which is much less well known. The Longevity Breathing program is based on these Taoist breathing methods. Unlike some Pranayama methods, when you are doing Taoist breathing you never hold your breath or force it. Instead you learn to slow down your breathing and make it fuller and more relaxed. Taoist breathing also helps to cultivate meditative awareness. If I had to teach one exercise that would have the greatest transformational benefit for the least effort put in, it would be to teach people how to breathe, on a daily basis, with the same the full-body, relaxed engagement of a baby. These breathing techniques are good for everyday life, not something that you only practice a few minutes a day. Many people take short, shallow breaths and use only a small portion of their lungs. In this DVD, I show how breathing fully from the belly helps oxygen reach the back and sides of the lung and massage all the internal organs. Using Longevity Breathing can help people mitigate lung illness, such as asthma and emphysema. Animations show you how these techniques work to massage your internal organs and give you greater lung capacity. At the end of the video, I will guide you through a 15-minute practice session. Longevity Breathing can keep you relaxed and able to cope in moments of fear, anger, tension and anxiety, and release tensions in your nervous system. These breathing methods feel so natural that you will wonder why nobody taught them to you before. Once you learn them, you’ll never go back to being a shallow breather.